A crash course in Helghast warfare. Beware: hammy voice-acting ahead. Friends! Helghans! Hairless red-eyed bastards! Lend me your ears. Lend them to me right now, my little lads – or by all that’s unholy, I’ll rip them off and shove them so far up your arses you’ll ‘ear your own ‘eartbeats! I am Sergeant Fistbullet, and I am ‘ere to make men of you, troopers. No, not in that sense, Private Dreg. Do up your trousers, there’s a good boy. 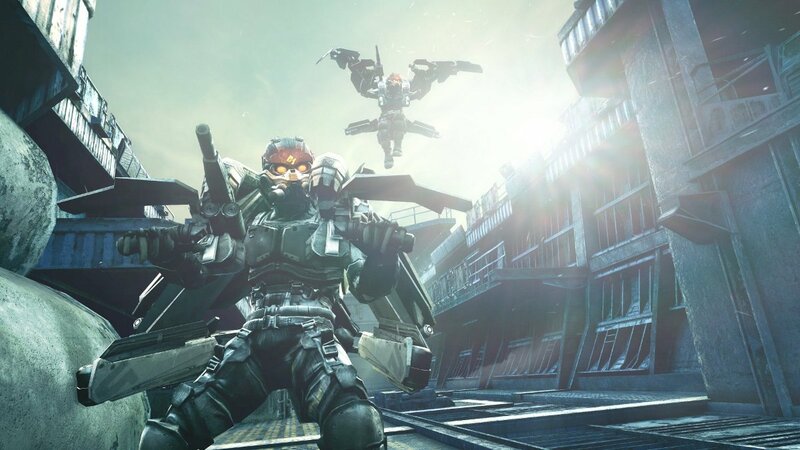 We ‘ave been fighting the ISA invader for many months now, and it ‘as come to the attention of Helghast High Command that a large number of you rank and file is dying without prior written permission. My job, what I undertake with the greatest zeal and seriousity, is to ensure that this does not happen, or at least that it does not happen at a time non-convenient to the Helghast cause, like when you’ve just pulled the pin out of a frag grenade. And with that in mind, I do hereby bestow on you the fruits of my immense combat experience. This, you maggots, is the Dualshock 3 controller. It is your weapon, and your very best friend, and your dear old Nan. You will eat with it. You will sleep with it. But first, first you will go to the Options menu, and you will select Controller Settings, and you will turn them Y and X axis sensitivities right up to one hundred and one percent. Sometimes all you can see is particle effects. Because if there is one disadvantage, lads, to living on a planet with a toxic atmosphere, constant lightning storms, zero edible vegetation, extremes of temperature and an infestation of humongous insects, it is this: you will move around the battlefield at a less than desirous velocity. And you do not ‘ave the luxury of moving around the battlefield at a less than desirous velocity, my boys. You are Helghast soldiers. You ‘ave got big orange lights mounted on your faces. If you are lackadaisical some pink-skinned sod with a mohawk is going to see you, lads, and when he sees you he is going to shoot you, lads. You will need all the help you can get. 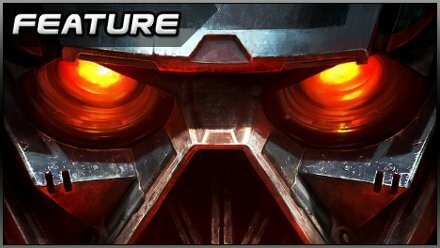 And you will also need to pick your class – and Helghast High Command takes this opportunity to remind you that when you pick a class, you must behave in a manner befittin’ of that class. For the benefit of those of you that are inacquainted with the manner befittin’ of each class, I will proceed to outline some particularities. Medics! Step forward, you ‘orrible pansies. It is my great pleasure to inform you that you are no longer quite as wimpy as you were when the present ‘ostilities commenced. With time and effort you will get your ‘ands on the Shotgun, and the Silenced Machine Pistol, and a Medi-Drone armed with Gatling guns, and you will be a force to reckon with at close range. At the ‘ighest levels, you will find that you can miraculously come back from the dead when you are immortally wounded. But do not get too big for your boots, Medics. You are there to keep your comrades in one piece, boys, not to prance around like an angry poodle. Your Drone will not save you from snipers – in point of fact, it will ‘over close to you and make you easier to spot. Seein’ as you is thick as mud, troopers, Helghast High Command has kindly automaticated your ‘ealing skills. All you need do to patch up the man standing next to you is remain standing next to him. Can you ‘andle that, lads? Because if you can not ‘andle that, lads, you ‘ad better stay home and play Dance Central. Jetpack engines only fire for a few seconds at a time. Next, Tacticians! You are without doubt the most disgustin’ bunch of flash, preenin’, campin’ buggers I ‘ave ever laid eyes on, and I am thus-fore-with delighted to announce that your precious, precious spawn grenades are no more. Beginning this moment, the only spawn points you will get will be the ones you can capture, of which there will be ‘ardly two nor three per theatre of war. Assumin’ you ‘ave somehow requisitioned, tasted and enjoyed the Earthly apple, Tacticians – ‘ow do you like them apples? Be not overtly perturbed though, you troupe of flouncin’ ballerinas, because what Mother Helghast takes with one hand, she gives back with the other. You will notice that you ‘ave a Rocket Launcher at your disposal. It is slow to launch, and slow to reload, and may Visari help you if you shoot it from the hip or without ‘propriate covering fire – but when you hit something or somebody with it, the only reason they will not know they’ve been hit is because they is dead. You will also find that you is now furnished with the Spot and Mark ability, which you will employ to advertorialise the presence of enemy troops to any Marksmen who may be skulking, like the weasel scum they is, in the vicinity. 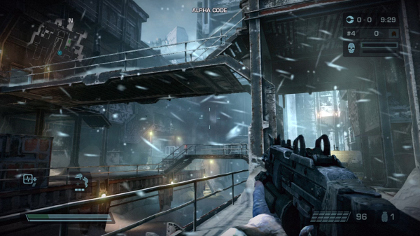 Posted in Features, Top 5, and tagged with Guerilla Games, guerrila games, kz3, PlayStation 3, PS3, SCEE, Sony. I really wish you only used that style of writing for the introductory paragraphs and not through the whole guide… annoying. But I still thank you for this guide. Got say I disagree with the above comment.